Bulgaria earmarked just more than one per cent of GDP for defence spending in 2016, below the EU average, EU statistics agency Eurostat said on May 18. The figures were released just two days after Bulgaria’s Cabinet agreed to ask Parliament to approve projects estimated to cost 3.44 billion with VAT, for military modernisation involving the acquisition of modern fighter jets and 150 armoured personnel carriers. It remains to be seen whether either of these projects would see a contract signed before the end of 2018, although Defence Minister Krassimir Karakachanov said that he hoped this would happen. Eurostat said that in 2016, the EU’s 28 member tates earmarked 200 billion euro of public expenditure for defence. This is equivalent to 1.3 per cent of GDP. This is much less than the amount spent on social protection (expenditure equivalent to 19.1 per cent of GDP in 2016), health (7.1 per cent) or education (4.7 per cent), but higher than public spending on recreation, culture and religion (one per cent), environmental protection (0.7 per cent) and housing and community amenities (0.6 per cent). 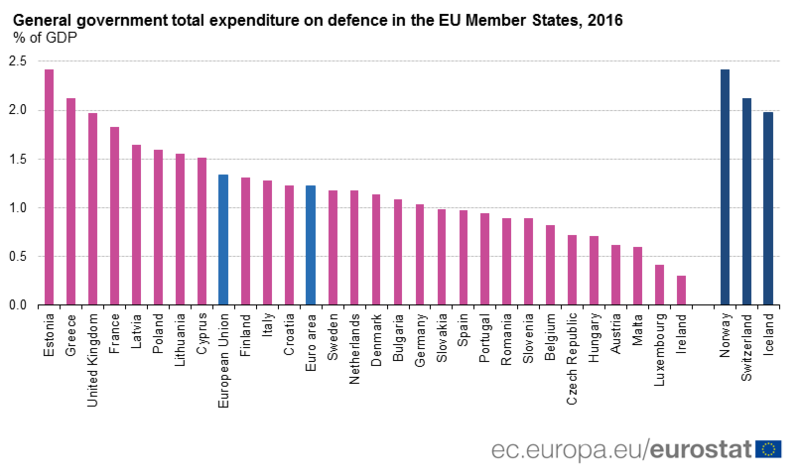 In 2016, the ratio of government defence expenditure to GDP varied across EU member states from 0.3 per cent in Ireland, 0.4 per cent in Luxembourg, 0.6 per cent in Malta and Austria, to 2.4 per cent in Estonia, 2.1 per cent in Greece, two per cent in the United Kingdom and 1.8 per cent in France. In absolute terms, the UK spent the most on defence (the equivalent of 47 billion euro in 2016). This is equivalent to almost a quarter (24 per cent) of the total EU public expenditure on defence. 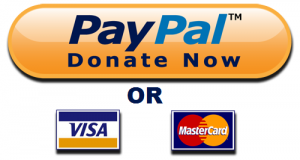 It was followed by France (41 billion euro, or 20 per cent of the EU total), Germany (33 billion euro, or 16 per cent) and Italy (22 billion euro, or 11 per cent). Together, these four EU countries accounted for 71 per cent of the total defence expenditure in the EU, Eurostat said.